Made with British Potatoes and cooked in High Oleic Sunflower Oil. 6 pack. 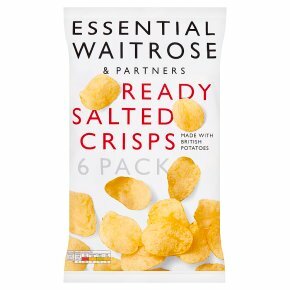 To get great crisps, you need to start with the very best potatoes. Ours are all grown in Britain, by a family firm we've been working with for over ten years. Together, we carefully select the perfect varieties, so every harvest gives us potatoes that make beautifully crunchy, golden crisps. We fry our crisps in high oleic sunflower oil, so they are high in mono-unsaturated fats.